Relevant chapter from "History of the Great War - Naval Operations"
The action took place around 51.09N, 01.37E where the two German ships went down, Swift and Broke were in dockyard hands for several weeks and there were no more destroyer raids on the Dover Straits for ten months. Cdr Evans was feted in the British press as "Evans of the Broke". Admiralty, S.W. 10th May, 1917. Honours for Service in the Action Between H.M. 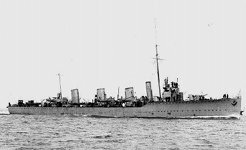 Ships "Swift" and "Broke" and German Destroyers on the night of the 20th to 21st April, 1917. Cdr. (now Capt.) Ambrose Maynard Peck, R.N. Cdr. (now Capt.) Edward Ratcliffe Garth Russell Evans, C.B., R.N. Lieut. Geoffrey Victor Hickman, R.N. Navigator and second in command of H.M.S. "Broke." He assisted with great coolness in handling the ship in action. His proper appreciation of the situation when one enemy destroyer was torpedoed, which his commanding officer had made ready to ram, enabled course to be altered in time to ram the next astern. Lieut. Robert Douglas King-Harman, R.N. Navigating Officer of H.M.S. "Swift." He was of the utmost assistance to his commanding officer throughout. Lieut. Maximilian Garden Despard, R.N. First and Gunnery Lieut of H.M.S. "Broke." He controlled gun fire and gave the orders which resulted in an enemy destroyer being torpedoed. Lieut. Henry Antony Simpson, R.N. Executive Officer and Gunnery Lieut, of H.M.S. "Swift." He displayed great coolness and method in the control of fire which he had very ably organised and zealously drilled, and greatly assisted his commanding officer throughout the action. Surg. Prob. Christopher Thomas Helsham, R.N.V.R. ("Broke"). Surg. Prob. John Sinclair Westwater, R.N.V.R. ("Swift"). Worked with great energy and ability in attending to the wounded. Gnr. (T.) Henry Turner, R.N. ("Swift.") Obtained a hit with a torpedo on one of the enemy destroyers. Gnr. (T.) Frederick Grinney, R.N. ("Broke.") Gave orders for the firing of the torpedo which struck one of the enemy destroyers. Mid. Donald Allen Gyles, R.N.R. ("Broke.") He took charge on the forecastle, and, although wounded in the eye, organised a gun's crew from the survivors of the crews which had suffered heavy casualties and kept the guns on the forecastle going. He repelled the German sailors who swarmed on board from the destroyer which was rammed, and remained at his post until after the action was finished. To receive the Conspicuous Gallantry Medal. A.B. William George Rawles, O.N., 20176V (Po.). 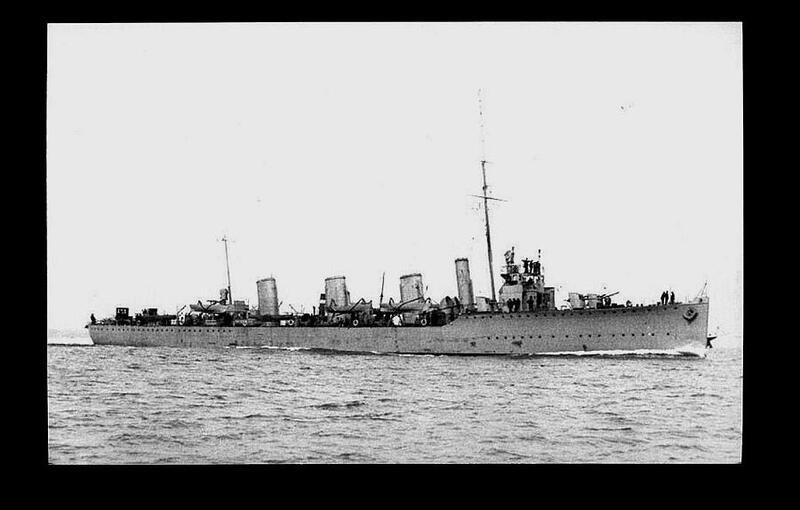 Although he had four bad wounds in his legs, in addition to other injuries, he continued to steer H.M.S. "Broke" in action until the enemy destroyer had been rammed. O.S. Herbert Thomas Huntley Fowle, O.N., S.S. 7516 (Po.). Sto. Charles Williams, R.N.R. (New Zealand), O.N. 2/358. Sto., 1st Cl., John Clasper, O.N., S.S. 103869 (R.F.R., Po./B. 4652). Ch. Sto. William Shearn O.N., 279752 (Po.). P.O. Tel. Harry Sedgley, O.N., 239909 (Dev.). P.O. William Edward Strevens, O.N., 232542 (Po.). P.O. George Henry Proud, O.N., 218906 (Po.). P.O. Albert Last, O.N., 208689 (Po.). A.B. Sidney Clarke, O.N., J. 5244 (Po.). A.B. Charles Reginald Norton, O.N., J. 18427 (Po.). A.B. Ernest Ramsden Ingleson, O.N., J. 5723 (Po.). A.B. Walter Frederick Mair, O.N., J. 55500 (Po.). C.P.O. John Crother Ashton, O.N., 157639 (Po.). P.O. Sidney Albert Simmonds, O.N., 180242 (Po.). P.O. Charles Henry Daish, O.N., 182240 (Po.). Ch. E.R.A. William Culverwell, O.N., 268992 (Ch.). P.O. Frederick Percy Mursell, O.N., 162299 (Po.). Ch. Sto. Henry Simmons, O.N., 276070 (Ch.). Sto. P.O. William Edward Heaseman, O.N., 361422 (Po.). Yeo. Sig. Albert Ebenezer James, O.N., 210513 (Po.). Sto. P.O. James Bryant, O.N., 310822 (Po.). Sto. Edward Gilfillan, R.N.R., O.N., 9099, S.
Sto. Sidney Frederick Brooks, O.N., S.S. 111490 (Po.). Engr. Lieut.-Cdr. (now Engr. Cdr.) James Hughes, R.N. Engr. Lieut.-Cdr. (now Engr. Cdr.) Thomas George Coomber, R.N. Lieut.-Cdr. Arthur Jermyn Landon, R.N. Sub-Lieut. Whitworth Brady Nicholson, R.N. Act. Sub.-Lieut. Lionel Hill Peppé, R.N. Wt. Mech. James Coughlan, R.N. Act. Art.-Engr. Charlie Rodgers Barter, R.N. Mid. Maurice Theobald Maud, R.N.R. P.O. Charles Christmas Brown, O.N., 155936 (Po.). Ldg. Sig. William Page, O.N., 227145 (Po.). Ldg. Sto. Frank William King, O.N. 306009 (Po.). Ldg. Sto. Eli Daniels, O.N., 294996 (Po.). E.R.A., 2nd Cl., Walter Blanchard Wellman, O.N., M. 1218 (Po.). A.B. William George Cleeter, O.N., J. 21405 (Po.). 2nd Cl., Frederick Arthur Hickman, O.N., K. 33575 (Po.). Sto., 1st Cl., George Henry Doe, O.N., K. 7694 (Po.). A.B. John Henton, O.N., J. 17762 (Po.). Sto., 1st Cl., Albert Edward Glover, O.N., 232320 (Po.). A.B. Henry Alfred Hitchin, O.N., 228372 (Po.). Ldg. Sig. Charles Claude Higgins, O.N., J. 10417 (Po.). S.B.A. James Gradwell, O.N.,M. 16759 (Po.). Sto., 1st Cl., Ernest Muff, O.N., K. 32517 (Po.). Sig. Sidney Charles Helps, R.N.V.R., O.N., Z/9587 (Tyneside). Ch. E.R.A. Ralph Victor Nelson, O.N., 272497 (Po.). E.R.A. Henry Albert Riley, O.N., M. 4676 (Po.). Sto. P.O. Matthew Lawson, O.N., 303088 (R.F.R., Ch/B.5783). Ldg. Stoker Frederick Thomas Yapp, O.N., K. 1672 (Po.). Sto., 1st Cl., John Kempton Falconer, O.N., K. 32518 (Po.). Sto., 1st Cl., Charles Herbert Harvey, O.N.. S.S. 115725 (Po.). Sto. P.O. Thomas Davies, O.N., 289400 (Po.). Ldg. Sto. Charles Edward Walls, O.N., K. 969 (Po.). Sto., 1st Cl., Charles Edward Miller, O.N., 280751 (R.F.R. Po./B. 2355). Cdr. Edward Ratcliffe Garth Russell Evans, C.B. Engr. Lieut.-Commanders to be Commanders. Engr. Lieut.-Cdr. Thomas George Coomber. All to date April 21st, 1917. Act. Sub-Lieut. Lionel Hill Peppé, R.N.